Be on time always with this exquisite creation from Maxima. This timepiece offers a round Analog dial. It features two sub dials with hour markings and hour, minute and second hands, brand name and logo on the dial and a textured black leather strap with red stitch accents to add to its appeal. 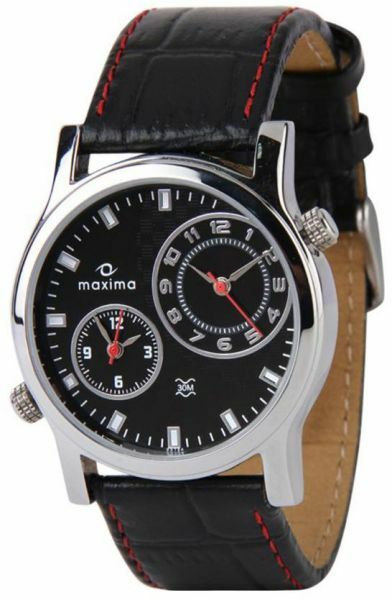 Be on time always with this exquisite creation from Maxima. This timepiece offers a round Analog dial. It features two sub dials with hour markings and hour, minute and second hands, brand name and logo on the dial and a textured black leather strap with red stitch accents to add to its appeal. Also, the water resistance of this creation makes it an ideal pick for the outdoorsy people.